MCA Engineering is part of MCA Group, an international player in engineering and high-tech consulting. Powered by Engineers ! We are building one of the most important technology companies in Sweden and Europe - do you want to join us? MCA Sweden is part of MCA Group, an international player in engineering and high-tech consulting. MCA’s consultants are engineers commissioned for strategic and technical projects in some of the biggest companies in the industrial and tertiary fields. We support our clients with their innovation and R&D issues during the entire product life cycle. More than 1400 engineers work for MCA, offering technical assistance in service centers or under fixed-rate contracts. The company has grown mainly organically, thus ensuring a stable and dynamic development. Both customers and engineers benefit from our international network – and our engineers can enjoy diversified projects in an international context. MCA was formed by engineers and advanced technicians, who offered their knowledge and expertise to several industries. 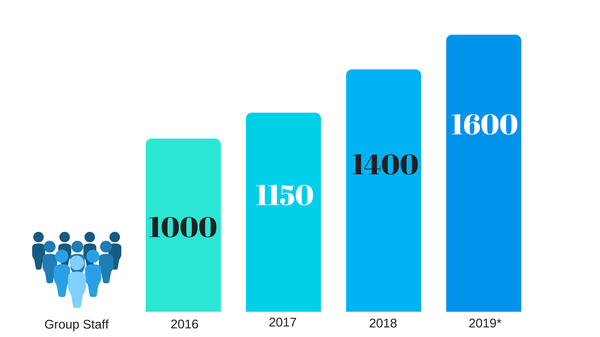 MCA has experienced a stable growth each year since the founding. Our success is based on a strong and independent financial situation, a human-sized structure and organization. MCA gives absolute priority to the satisfaction of its client needs and expectations. We are known for our Customer orientation and tailored solutions. The MCA group organization enables us to provide tailored solutions in various sectors, whether our customers require on-site technical expertise or other delivery models like fixed price projects, outsourcing or off-site service centers. Thanks to our fully high equipped research and test center in the North of France, MCA can offer development platforms which include engine testing facilities, calculation, simulation and CADM facilities as well as vibroacoustic and NVH testing facilities. This all makes it possible to work on major projects and to fulfill the needs and expectations of our clients very effectively. All MCA consultants apply the concepts of quality, client satisfaction, responsiveness, commitment and motivation. From the very beginning, MCA has always thought it was essential to respect those values which have helped the company resist the economic crisis and develop its growth. 2015: Creation of subsidiaries in Italy and Spain. 2013: Creation of subsidiaries in Sweden, Germany, the Netherlands and Benelux. 2012: Creation of a center specialized in information systems. 2011: MCA purchases an engineering consulting company as well as a research department dedicated to energy. 2006-2009: New agencies open in France in Aix-en-Provence, Lille, Lyon and Nantes. Creation of MCA Benelux. 1991: Creation of MCA by its current CEO Pierre Ebenstein. MCA offers 4 areas of service with several levels of investment depending on the client’s needs. We work directly with the client on-site or at our own offices. MCA is able to provide comprehensive project management due to our long-term experience in several sectors. We offer all kind of services to our partners – from planning to implementation to project end – and always apply our “best practice”, leading to successful and efficient projects. MCA is applying this expertise in various sectors. MCA has technical experience in system architecture specification and the development of embedded software. MCA has expertise in software validation, integration installation and deployment. The sector is undergoing a transformation with new market entrants. To remain competitive, the major automotive groups are investing heavily in R&D, particularly in propulsion, ADAS systems, on-board systems, autonomous and connected vehicles, electric vehicles and the reduction of polluting emissions. To support all these developments, automobile manufacturers have increased the outsourcing rate of their Research and Development by relying on strategic partners such as MCA. 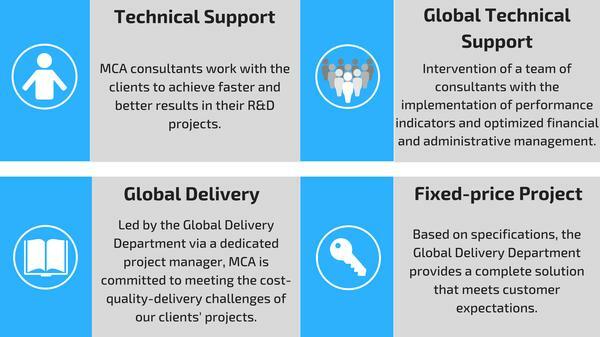 To respond optimally to these strategic challenges, MCA consultants are engineers with a strong technical dimension. Historical sector of MCA, our customers are the European manufacturers and equipment manufacturers. The varied skills of our teams enable us to support our industrial customers in all areas of the automotive industry and throughout the entire product life cycle: from design-design to commissioning and testing, to after-sales service (design and implementation of software for testing and maintenance procedures, for example). The aeronautics sector offers strong growth prospects with the sustained increase in air traffic. This leads to an increase in orders and therefore in the production rate. Industry players are investing in R&D to produce cleaner aircraft. At the same time, the sector is becoming digital: equipment manufacturers and manufacturers are integrating new technologies (big data, virtual reality, factory 4.0, robots, etc.). The introduction of artificial intelligence opens new perspectives. The maintenance market is undergoing a complete transformation to obtain better performance. The market outlook is therefore based on the capacity of the major players in the sector to innovate, while controlling production constraints. In Space, the launchers and satellite communications market is very dynamic. The sector is gradually industrializing with the arrival of new players from the private sector allowing a drop in the cost of production. Global competition drives innovation and investment. In Defence, faced with an unstable geopolitical context, governments continue to invest massively, particularly in cyber security. MCA is involved in Aeronautics, Space and Defence industrial projects throughout the product life cycle in France and internationally. The Group has set up partnerships in France and Vietnam to propose innovative and economic solutions in the field of mechanical calculation applied to Aeronautics. MCA has a team of consultants at the cutting edge of technology, who are attentive to customers and users in order to propose ever more innovative and effective solutions. MCA Sweden combines the benefits and flexibility of being a young entrepreneurial company with the structure and financial strength of a large international group. You will have the opportunity to work on technological and challenging projects for prestigious clients. We accompany you throughout your career according to your aspirations. For this, you benefit from a daily and personalized HR follow-up. MCA promotes the internal promotion, mobility and professional development of its teams. 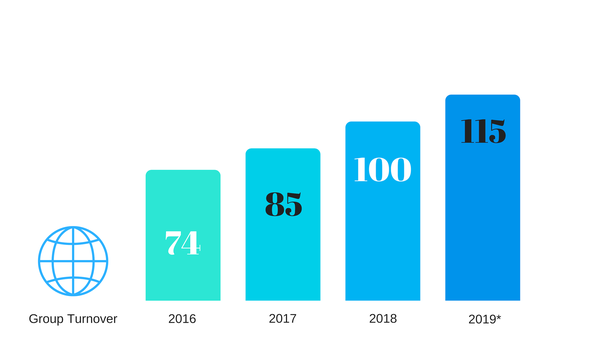 Our extremely dynamic growth enables us to develop our activities in France and abroad, which offers all our teams varied opportunities within the Group. You work into a friendly and stimulating environment! In order to encourage communication between employees, several events are organized (annual evening, teambuildings, afterworks, sporting events ...). We also offer various services to improve the quality of life at work (fruit baskets, massages, relaxation areas, collaborative workshops, food and sports partnerships ...). 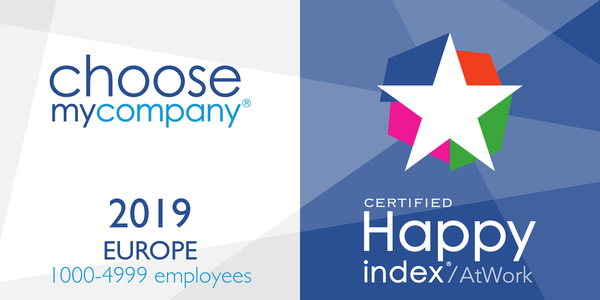 MCA is certified Happy At Work 2019 ! Welcome to our new recruitment campaign "TCP 2018" ! MCA’s strategy is to develop the competencies of its employees. This implies an active and understanding human resources policy. Thanks to investment in many business sectors in many regions around the world, MCA has opened up numerous opportunities for professional and personal development both in Sweden and abroad. Joining MCA means revitalizing your career while being provided with opportunities for growth and development. 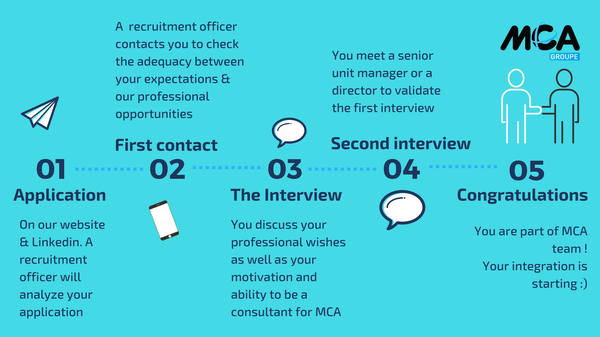 MCA is recruiting long-term contracted consultants who have graduated from top engineering schools and demonstrate extensive technical knowledge and professional expertise. Since our clients are mainly key accounts, personality is as important as knowledge. More than technical competencies, MCA is looking for positive, open-minded personalities with great adaptability and a natural curiosity. Consultants are in daily contact with strategic positions and act as MCA’s ambassadors to our clients. Thanks to increasing growth, MCA is continuously looking for new talent. An internal recruitment team is fully dedicated to identifying the kind of profiles we need. An initial telephone call is scheduled with one of our recruitment officers to confirm the basic information of your profile: availability, mobility, education, career development, etc. You will then meet members of our management team responsible for sales development and consultant management. Our managers know the local conditions and are able to match your profile and career path with our needs. You will have a maximum of three interviews. One of MCA’s strengths is the quality of our professional support. We always make sure our managers and consultants have the best possible relationship and work closely together. During any project, whether it be on-site or at MCA’s office, regular update meetings are scheduled to discuss progress. The main objectives of these meetings are to ensure that the collaboration is efficient, to anticipate future activity, and to guide the consultant’s development. MCA always tries to adapt itself to the consultant’s requests regarding area and position. Moreover, events are planned several times a year with managers and consultants from different business sectors with the aim of promoting internal cohesion and sharing experiences. Managers, with the help of our human resources teams, offer support and follow-up with our consultants on a daily basis. MCA supports the technical development of our engineers and always aims to achieve the perfect match between their competencies and career path. The candidates we recruit work in a position directly matching their competencies and experience. MCA supports consultants in their professional development and each one is offered training adapted to their career path. On a long-term basis, engineers who work for MCA gain critical knowledge. Our company identifies the cross-functional competencies of our consultants, allowing them to work for our key accounts in different business sectors. Consultants benefit from gateways between markets and are able to choose the position that fits them the best. Building knowledge and diversifying competencies remain strong assets for any consultant’s career path. Ready for that exciting and challenging future? Become a consultant for MCA! MCA has been awarded the ChooseMyCompany - HappyIndex® / AtWork label ! 60% to join this year’s exclusive groupof the best companies. to rank MCA among the leading employers according to their employees. stimulating environment – management – rewards & recognition – pride – pleasure. strong performance of MCA in pleasure and professional development ! outside. » said Pierre HUMBERT, CEO Deputy of the Group MCA.